Read about our services here. We offer Junk Removal in the DC Metro Area 7 days a week 7am - 7pm. Just click the service below to find out even more, and make sure to give us a call today so that we can help you take back control of your living space! Mack Hauling isn't just about quickly and professionally removing your clutter or unwanted items. it's also about making the space that you live in more spacious. We're here to help you create opportunity out of the space you already have. We also offer services for business professionals, such as realtors, HOAs, Property Managers, and landlords! Mack Hauling is a full service junk removal contractor. We can haul anything quickly, professionally, and affordably. Mack Hauling is dedicated to the fast, professional, and affordable removal of any unwanted junk or clutter that's in your way. We pride ourselves on being in and out as quickly and quietly as possible, and ensuring that jobs are 100% complete and keep our clients 100% satisfied. We can haul just about anything, from massive dining room tables and sofa sectionals to construction debris, decks, and fences. We believe that honesty and hard work should form the bedrock of any business. We place a high value on corporate responsibility. We donate all still-usable items to various charities, including Habitat for Humanity. We know the constant hustle and bustle of daily life around the Washington D.C. area. Between work, family, the gym, sports, school, and hundreds of other activities including home improvement and other chores; who has time to eliminate unused item? If time is found to address such needs getting help and the needed truck and even cleanup afterward, can be the hardest part and often pushed off to do later. 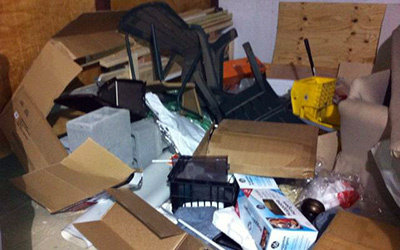 As the area's premier junk removal business, it's up to us to help you with this cumbersome task. Whether you're cleaning out your basement, remodeling, need a fence, deck, or carpet removed, have an old refrigerator that needs to go; Call Mack’s Hauling. We can do it all. We even offer FREE estimates on our work! 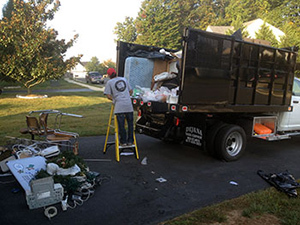 We serve Maryland, DC, and Virginia homeowners, property managers, realtors, remodeling contractors, residential and commercial developers, and anyone else who’s looking for fast, reliable, junk removal at affordable prices! If it’s not on the list, it doesn’t mean we can’t haul it! We do our best to be in and out in a flash so you are not inconvenienced. We also make sure to donate any still usable items to various charities. If you're a DC Metro area resident, there's a good chance that you're busy almost constantly. If you don't have a few spare hours, a truck, and several strong buddies, getting rid of large pieces of furniture is a massive hassle. Between the time you'll spend moving the piece, the gas you'll use, and dump fees, you're likely better off hiring a professional. Our Furniture Removal Service is the perfect solution for Northern Virginia, Maryland and Washington DC residents and businesses. We're fast, professional, and affordable. We also donate any still-usable furniture to those in need through a number of charities including Habitat for Humanity! Furniture Removal can also be tricky if you live in the city. Getting a couch down a three story walk-up, or even just driving a truck in heavy DC traffic can be a very daunting task. The good news is that we're used to hauling couches, and great at driving our trucks! When you combine our expertise, our free estimates, and our affordable pricing, Mack Hauling is the best value in town. Call or complete our on-line request form today for your FREE estimate. We serve Maryland, DC, and Virginia homeowners, property managers, realtors, remodeling contractors, residential and commercial developers, and anyone else who is looking for fast, reliable, furniture removal at affordable prices! 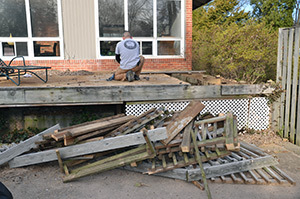 We provide deck and fence demolition and removal services. 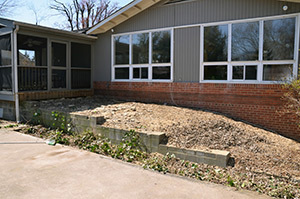 From start to finish, we can make old or rotten eyesores disappear. Mack Hauling is your hassle free deck and fence demolition and removal service provider you can count upon. If you have a rotting, deteriorated fence or deck, the offending structure can not only be an eyesore, but a safety hazard as well. Unstable decks or leaning fences present a number of dangers to both adults and children. When it comes to removing them, there are a number of options. Doing the job yourself can also be dangerous if you don't have experience with demolition. 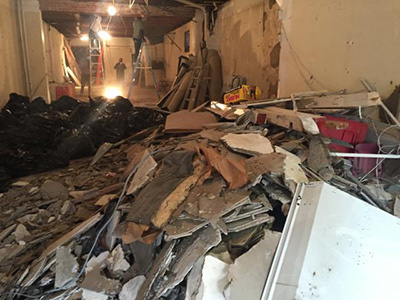 Property damage and injuries are fairly common consequences of inexperienced do it yourself demolition. The good news is that we can demolish and remove the structures quickly and professionally! We charge less than most general contractors, and we take charge of the debris removal, ensuring that your yard looks like the structure was never there to begin with! And remember, we are bonded and insured! We start by evaluating the structure. 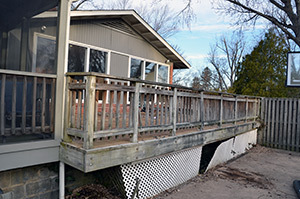 We need to understand how your deck or fence was built, and the structural relationship it has with your home, to ensure that we can remove it without any damage to the surrounding area. Once we have our plan of action, we will demolish the structure piece by piece, methodically. When we've finished demolition, we will haul all of the debris and associated trash from the site, leaving it completely spotless! Complete our FREE Estimate request form now and we will respond quickly. 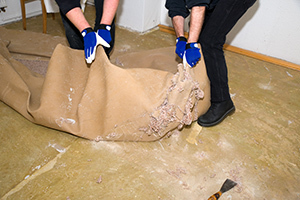 Our carpet removal services include removing currently installed carpet and padding, hauling it out like it was never there. An old carpet should cause you concern. They can absorb odors, debris, and even harmful contaminants or allergens. If you've had it with a carpet in your home, you may be looking for the best way to remove it. Removing a carpet that's been professionally installed can be tricky and dangerous if you don't have the right kind of experience. Finding somewhere to dump it can be tricky as well- renting a truck and paying dump fees can be expensive, not to mention time consuming. At Mack Hauling, we're fast, professional, and affordable. 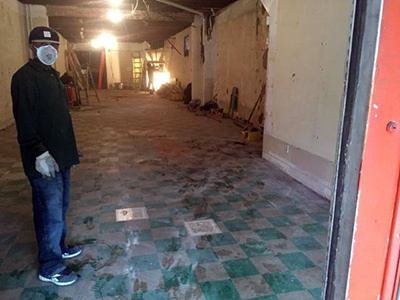 We've removed hundreds of carpets, and we can be in and out in no time! 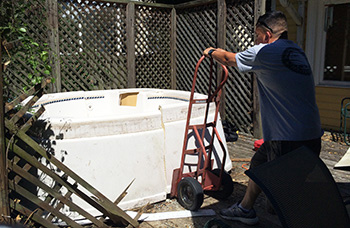 We offer free estimates, so if you don't have the time to do the job yourself, make sure to give us a call. As far as Carpet pickup and removal services in the DC Metro area are concerned, we're number one in price and efficiency! We serve Maryland, DC, and Virginia homeowners, property managers, realtors, remodeling contractors, residential and commercial developers, and anyone else who’s looking for fast, reliable, carpet removal at affordable prices! Is Someone You Know a Hoarder? It is not uncommon to have some clutter in our homes, but for some people this disorganization and accumulation of items has taken over their whole house. For people with homes so cluttered they become overwhelming to themselves or others, this can affect their family relationships and raise daily stress levels. Often families are not able to address the situation for their loved one until left with an estate clean up or addressing a foreclosed home. Often, we help clean out homes that could be classified as hoarding situations. Hoarding is the acquisition of large quantities of worthless junk items combined with the inability to discard them. This behavior may be associated with various psychiatric problems, but it is most commonly found in those with obsessive-compulsive disorder (OCD). 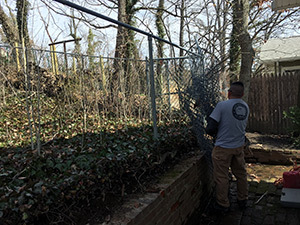 When faced with a hoarding cleanup in DC, VA, and MD, having professionals assist you will help not only remove the debris and allow a 3rd party to control the removal process to help keep emotions under control. Through these experiences, we have learned how to safely and sensitively use our expertise to help individuals and families step into a cleaner, more stress-free living situation. Mack Hauling recognizes preventing waste is of particular importance to people coping with hoarding issues. We take every effort to divert useful items from the landfill. Our professionals will set up staging areas on most jobs involving hoarding cases to sort items from true trash to what can be used. Gently-used items are donated to local charities and recyclable items, including scrap metal, wood, plastic, and electronics, are recycled. 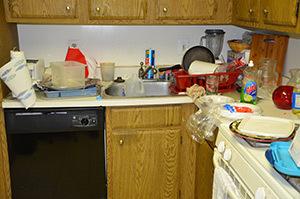 However, due to the nature of hoarding, some items may be so soiled that discarding is the best option. We will address the problems associated with the buildup of trash, food waste, junk, garbage, animal feces, and other problematic waste. Get rid of the clutter now. 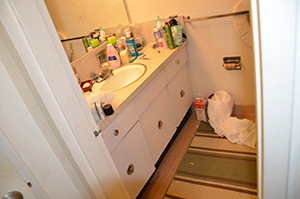 Some of the symptoms of hoarding, such as indecisiveness, avoidance, and procrastination, can prevent anyone who is afflicted from being able to live in a sanitary, safe, orderly environment. Often, a family member, friend, or social worker must step in with some assistance. When that happens, call upon the junk removal specialists at Mack Hauling. Mack Hauling is the fast response solution you need for the hoarding situation you are addressing. We will work to help you make the transition to a clutter free, healthy lifestyle change. Clutter builds up. Occasionally, business owners, landlords, homeowners, real estate agents, and sometimes loved ones bear the responsibility of dealing with a seemingly insurmountable amount of trash or debris. Tackling this kind of clean out job is usually a difficult task, and can sometimes be dangerous. Depending on the buildup of various allergens, molds, mildew, contaminants, unstable structural elements, and number heavy items, some people may find themselves physically unable to do the job. Time, though, is the number one most concerning factor. These jobs can take days for many people that don't have the right manpower or equipment. At Mack Hauling, we pride ourselves on our speed, efficiency, professionalism, and prices. We work with a number of landlords, real estate agents, and even families that need help clearing out cluttered spaces. 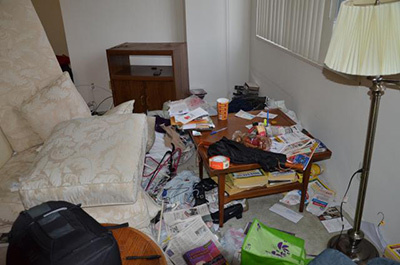 We also have plenty of experience cleaning out the homes of hoarders, which can be difficult. From start to finish, we clean out spaces and haul away all of the trash or debris. We offer free estimates as well, so call us today to get started! Keeping unused items in home, office, and storage unit space can result in an expensive situation. Do you really need to keep it all? Stop paying to store items you no longer need. Who wants to pay for storage that is just holding trash and accumulated junk? When you come to the realization your storage unit is filled with the junk you not longer want and is hoarding your junk, it is time to call Mack Hauling. We will clear out the storage unit of all unwanted items. This frees up space for things that truly need to be stored, or eliminating the expense entirely! You tell us what stays and what goes and it will be our backs doing the hauling. Items you want to keep will be replaced in the unit in an orderly fashion. 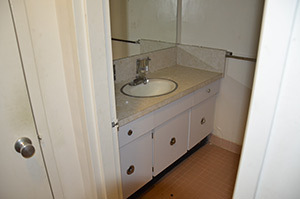 Item removal: Closets, Cabinets, Drawers, Trash, Furniture, etc. We serve Maryland, DC, and Virginia businesses, homeowners, property managers, realtors, remodeling contractors, residential and commercial developers, and anyone else who’s looking for fast, reliable, junk removal at affordable prices! Complete our FREE Estimate request form now and we will respond quickly. 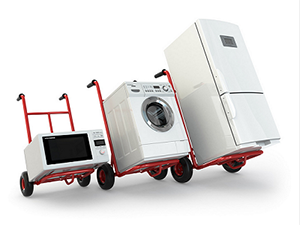 We can haul any appliance in Northern Virginia, MD, & the DC Metro Area! A broken or worn out appliance can be tough to move. Without the right equipment or a legion of helpers, a truck, and a lot of time on your hands, this task just can't get done. Luckily, we have tons of experience hauling appliances of all sizes! 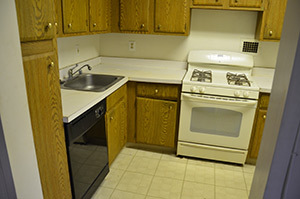 Whether you have a broken down refrigerator, or a washer/dryer pair that has to go, we've got you covered. We're fast, professional, and affordable. We also provide FREE estimates, meaning that you know exactly how much the job is going to cost before we get started. We even donate still-usable items to various charities, including Habitat for Humanity! We also dispose of all appliances in a safe, green, manner. Improper disposal can be harmful to the environment, so you can rest easy by choosing Mack Hauling. Call us today to get started! We serve Maryland, DC, and Virginia homeowners, property managers, HOA’s, realtors, remodeling contractors, residential and commercial developers, and anyone else who’s looking for fast, reliable, junk removal at affordable prices! When planning to renovate your home in VA, MD, or DC, think of hiring Mack Hauling to do the construction cleanout service to do the cleanup and haul away the construction debris. Our Company has years of experience removing construction debris in Northern Virginia, Washington DC, and Southern Maryland for homeowners and general contractors. Mack Hauling caters to contractors, homeowners, as well as do-it-yourself builders. By ordering our construction cleanup removal services, you will save time, money and energy. We offer professional service at lower costs than you may imagine with competitive rates. We can help to prep an area for construction including demolition and removal of small outbuildings, sheds, fences. We can handle a gut out. We knock it down and haul it away! We offer wet drywall removal, wet sheetrock removal, wet plaster removal, wet ceiling removal, wet wall removal, wet hardwood floor removal, wet laminate floor removal, wet tile floor removal, wet wood floor removal, wet carpet removal, wet carpet pad removal and wet kitchen cabinet removal and wet furniture removal. If it is destroyed and needs to go, give us a call. Our construction cleanup service knows how important it is to maintain a clean and organized construction site. 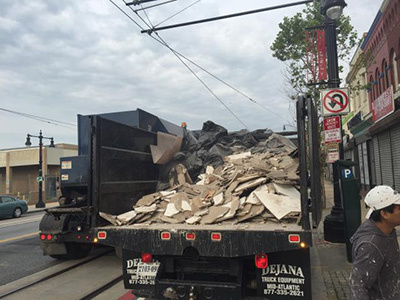 Having construction debris scattered throughout your property can lead to safety hazards, fines, and angry neighbors.